Q: How do you make your Extra Virgin Avocado Oil? 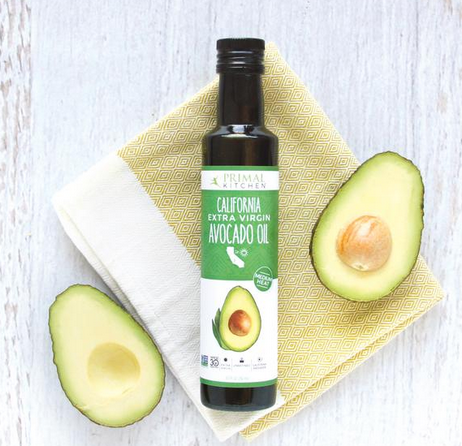 A: Our tree-to-table extra virgin avocado oil is made by cold pressing the flesh of premium grade-A avocados, exclusively grown in California. No heat or chemical extraction is used in producing Primal Kitchen Extra Virgin Avocado Oil. We do not use the skin or the pits, those are composted at the facility. Q: Where do you source your avocado oil from? A: Our avocados are sourced from handpicked, Grade A premium California avocados (of the Hass variety). Fruit is grown in SoCal, Pressed in Socal, bottled in SoCal and warehoused in SoCal (in our Oxnard facility). And all of that happens within a 90-mile radius. It doesn't get more Southern California than this oil. A: The Extra Virgin Avocado Oil suppliers and manufacturers are allergen free. A: Yes! Our avocado oil is naturally heat-stable and is protected from the elements in a beautiful dark glass bottle. Q: What is the best use of Extra Virgin Avocado Oil? The Extra Virgin is perfect for baking, sautéing, dressing or dipping, and generally a good use for cooking under 350 degrees. Q: Why does my Avocado Oil appear cloudy? A: The cloudiness can occur in the oil if it gets too cold, it can begin in the 40°F -55°F range. This is due to the natural hardening of the fatty acid and lipid components, the oil is not defective or harmful. The amount of cloudiness may vary based on temperature exposure and specific variations in the lipid profile of the batch.